Congratulations to "Jaclyn" the winner in Katie's giveaway. Thank you to all who participated! Thanks so much to Maureen for having me here! I love that this blog is just about romantic suspense! I fell in love with romance because of this particular genre and that love has only grown over the years. Thanks to author Linda Howard I was forever hooked and I’m glad that I’ve discovered so many wonderful romantic suspense authors over the last decade. It’s exciting reading about two people falling in love while running from drug dealers, a serial killer, a crime boss with a vendetta or any array of villains. When writing my own romantic suspense stories, location is always something I choose carefully. Since I was born and raised in Florida, a lot of my stories take place there. I moved away from there a couple years ago, but at heart I think I’ll always be a flip-flop, sundress wearing Florida girl no matter where I live. So even though I no longer live there, part of the way I keep that connection with my Florida roots is through my stories. Sometimes I make up cities because fictional places are always fun and in some cases I write about places I’ve lived or visited. In my new Red Stone Security series, all the stories take place in or around Miami, a city I adore. Why is Miami awesome? First off, the people. Then you’ve got Cuban coffee and cuisine, South Beach, deep sea fishing, a rich culture, a great art scene, some pretty cool television shows are filmed there, and the list just goes on. Even though the first two books in my new series, No One to Trust and Danger Next Door, are set against a sunny Florida backdrop, they’re both filled with danger, intrigue—and oh yes, sexual tension! Danger Next Door just released last month and the reaction I’ve received from readers has been amazing. I’d love to offer up a copy of both No One to Trust and Danger Next Door to one commenter! Danger Next Door, Book 2 Red Stone Security series: A contemporary beauty and the beast themed romantic suspense. Giveaway ends 11:59pm EST July 5th. Please supply your email in the post. You may use spaces or full text for security. (ex. jsmith at gmail dot com) If you do not wish to supply your email, or have trouble posting, please email maureen@justromanticsuspense.com with a subject title of JRS GIVEAWAY to be entered in the current giveaway. Oooh, more books to add to my TBR queue... this dissertation is seriously never going to be written! I've yet to visit Miami (or Florida! ), but I'm all about sun, sand, & flip-flops (or flip-flop weather, since I actually don't much like flip-flops :P). I'm sure there's some great scuba diving down there. 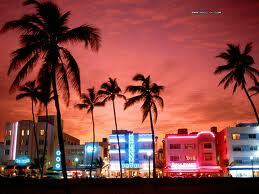 I have never been to Miami but I have always enjoyed watching shows set there just to see the setting. Another book at read. YEAH!!!! Linda Howard is a favorite of mine also! I love your paranormal novels. Can't wait to read these too! I am currently reading No One to Trust and am enjoying it. I hadn't looked ahead to see who the next book is about, but I see it is about Grant. Looking forward to that one, as I like Grant so far in this book. I really like Porter. I am around page 200 in the book and can feel the tension/frustration of Porter and Lizzy's chemistry. Porter has tried to be so honorable around Lizzy given she has narrowly escaped death a couple of times! They were almost able to be together until Porter's cell phone rang...sigh. I love romantic suspense and at 200 pages in I am hooked on your writing style. Thanks, Katie! Great post and interview. I have not read your romantic suspense books (although I love the genre) but have read Alpha Instinct and I am looking forward to Lover's Instinct. I am adding your RS books to my list to read. I'm not a Florida fan - hate the heat! - but love to read books with a Florida setting! Looks great! I'm adding this to my wishlist! "they’re both filled with danger, intrigue—and oh yes, sexual tension!" :) Sounds good to me! I love visiting different locales in books, but I truly enjoy the characters journey throughout the book... Thank you so much for the chance to win! Nice post. These books sound good. It sounds like you absolute enjoy writing & reading Romantic Suspense. I bet that this shows in your writing!! Please enter me in your generous draw. I'm so impressed by what versatile author Katie is! Thanks for the giveaway! Just finished Danger Next Door and I had to keep reading it to the end! Thank you for offering your books for a giveway! I can't wait to read Katie's new series. Adding the books to my list - love romantic suspense! Another book for the beach! Sounds interesting and I will have to pick it up. Thanks! Your book sounds interesting and exciting. I fell in love with romantic suspense a few years ago when I discovered Beverly Barton and realized that my own writing fell into this genre. I find that romantic suspense is the best of the romance genre...when two people who would not normally have been together are thrown into a situation where they have to work together to survive and that's when the sparks start to fly and sexual tension abounds!! Writing about location is not always easy for me, but in my first novel I created my own town in Upstate NY (I'm from lower Westchester County, NY) and found that I had more fun with it because you can get creative with building your town, coming up the names of your town's popular spots and so on. This was a great post and although I've never read your books before I will be adding them to my To Read list ASAP!!! Thanks for a great post!!! I've read such great reviews for your books and they are on the top of my wishlist!!! Congrats on the newest release! Fabulous thank you. I do love reading Romantic Suspense. I adore a protective hero. That is the main reason I love Romantic Suspense. The book sound lovely. Katie is a new author for me. This book looks great. Great covers. Love to read and always looking for new authors to check out. Thanks for the givedaway. Thank you everyone for stopping by! I apologize for not stopping by yesterday! I have very limited internet access the next few days :) Congrats to Jaclyn and thank you again Maureen for having me here!